It’s time to update my list of favourite restaurants in Paris. Many of the places listed below are near my apartment (at the border of the 7th and the 15th arrondissements by UNESCO and the Ecole Militaire). I have omitted the obvious expensive traditional French restaurants and the brasseries/bistros because you can find them on other lists and I don’t really like eating heavy meaty food all the time. Beware also that many of the famous restaurants (including brasseries and bistrots) don’t cook their food on site; the food is cooked in an industrial kitchen somewhere in (or outside) Paris and brought to the restaurant and reheated. As a result, the food is mostly disappointing. As of this writing, there’s a proposal in the French parliament to make restaurants disclose whether or not the food is cooked on the premises. A few restaurants listed below are Japanese. They take reservations only by phone. Sometimes the person answering the phone will speak some English, but most of the time, he or she will not. So if you speak even a little French, go ahead and try to reserve even if it’s difficult to understand the person on the line. It’s worth the trouble. Le Concert de Cuisine: Small restaurant that serves innovative French-Japanese food tucked away on a tiny street not far from the Eiffel Tower. Reservations necessary. Address: 14 Rue Nélaton, 75015 Paris. Phone +33 1 40 58 10 15. Wakaba: tiny Japanese restaurant with 4 tables and a 4-seat bar, delicious five-course 20 EUR set lunch (you can choose a main course from among the following — salmon teriyaki, chicken teriyaki, sashimi, tempura) on the rue de l’Exposition, close to the Eiffel Tower. Reservations necessary. In the evening, they have an 80 EUR “omakase” dinner (the chef decides what to serve you). Address: 20 rue de l’Exposition (metro: Ecole Militaire) Phone +33 1 4551 9081. Walaku: Come here for the 32 EUR bento lunch served in proper Japanese style. Even tinier than Wakaba, if that’s possible but really a lovely treat in Paris. Address: 33 Rue Rousselet 75007 Paris. Address: +33 1 56 24 11 02. Apatam Corner Cafe: This is a gem of a place in the 9th arrondissement, run by a couple (the chef is from Belgium). Quirky decor (you feel like you are in someone’s stylish living room) and delicious creative dishes. Reasonable prices. Address: 10 Rue Thimonnier, 75009 Paris. Phone: +33 1 77 16 01 44. Nol Bou: I’m at Nol Bou every week it seems because I love the food. The 15 EUR three-course lunch is delicious (especially the bulgogi) and the service is excellent. I’ve been to many other Korean restaurants in Paris and this one is the best, in my opinion. Note: if you reserve via La Fourchette for dinner you can get 40% off a la carte prices. Address: 22 rue Fremicourt 75105 Paris, off rue de Commerce. You don’t have to reserve most of the time. Alain Milliat: This restaurant has the best juices and delicious healthy food in an airy room filled with light. Make sure you take home one or more of their jams and fruit preserves — this is their specialty, in addition to the fruit juices. Close to rue Cler and the Eiffel Tower. Address: 159 rue de Grenelle 75007 Paris. Phone +33 1 45 55 63 86. You can reserve via Lafourchette.com. Les Climats: Best for outdoor dining in a small intimate courtyard, just down the street from the Musee d’Orsay. They have an amazing collection of 8500 bottles of Bordeaux wines. If the weather does not permit outdoor dining, the indoor restaurant is a stunning atmospheric room in which to have lunch or dinner. Innovative French food that is not heavy or greasy. Address: 41 Rue de Lille 75007 Paris. Phone +33 1 58 62 10 08. Sola: Refined French-Japanese cuisine close to the Notre Dame and the boulevard Saint Michel. Address: 12, Rue de l’Hôtel-Colbert, 75005 Paris. Phone +33 1 43 29 59 04. Reservations necessary. You can reserve a table at lunch via Lafourchette.com. Cafe du Commerce: Inexpensive, unpretentious traditional French cuisine in a beautiful dining room right on the bustling rue de Commerce. I love their steak tartare. Address: 51 rue du Commerce 75015 Paris. Phone +33 1 4575 0327. Reservations necessary. Lao Lane Xang: my favourite Laotian restaurant in Paris. Located in the Vietnamese-Laotian neighbourhood, it fills up quickly for lunch so try to go at noon or after 14:00. Address: 102 Avenue d’Ivry 75013 Paris. Phone +33 1 5889 0000. Bellota-Bellota: Specializes in Spanish pata negra, chorizo and other cured hams from Spain. They have a good wine list and other dishes, too. I go to either the 18 rue Jean Nicot address near the rue Cler or the 64 rue de Seine. Afaria: Innovative Basque food completely off the tourist trail. Address: 15 rue Desnouettes, 75015 Paris. Phone: +33 1 4842 9590. Here’s my original review of Afaria. It’s still very good. L’Audacieux: Innovative French cuisine by a young chef named Pierre Lambert. If you find yourself in the Levallois-Perret district, this is a good place to have lunch or dinner. Address: 51 Rue Danton 92300 Levallois-Perret. Phone: +33 1 4759 9417. Metro : Louis Michel or Anatole France. Aoki: This is possibly one of the most impressive patisseries in all of Paris because the founder, Sakaharu Aoki, creates French pastries with Japanese flavours and ingredients (green tea, red beans, and more). There are three shops in Paris, one of which is on 25 rue Perignon, 75015 Paris, just a few steps from the metro stop Segur. Rue Cler: This pedestrian street has a variety of food shops, wine stores, and cafes. I come here mostly for La Fromagerie (a small cheese shop) and Davoli (Italian deli that sells excellent bresaola, mortadella, speck, parma ham, fresh pasta). Rue Cler also has good fruit and vegetable shops. A la Petite Marquise: This small cafe/bakery/tea room serves delicious pastries. Address: 50 Avenue de la Motte-Picquet, 75015 Paris. Close to the Ecole Militaire. Avenue du Saxe market (Thursdays and Saturdays): La Bergerie du Mesnil is a stall close to the end of the market away from the Ecole Militaire side; they have the best raw milk, yogurt and sheep’s cheese (also sheep’s milk yogurt). Another stall you should visit is the one selling Congolese/Senegalese prepared food. Finally, for excellent Italian charcuterie and fresh pasta, there is an Italian stand on the left side of the market (if you are facing away from Ecole Militaire), and it is closer to the Ecole Militaire end. Here is our earlier post on the top cheese shops in Paris. Other notes: Lafourchette.com is the French equivalent of Open Table. You set up an account and can reserve online. Not all restaurants are on Lafourchette, notably the Japanese are absent. You can also read reviews written by other people who have been to the restaurants and you can get discounts as much as 40 percent. Reviews on Lafourchette are quite reliable — a restaurant that is ranked above 8.7 is very good. I’ve found French diners to be more brutally honest in their reviews than people in the US and they are exceedingly picky. You might be interested in Paris bistros and brasseries: French comfort food at its best. See all of our Paris articles. 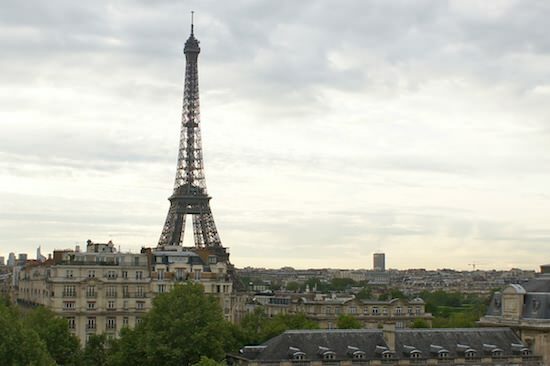 Photo of the Eiffel Tower below taken from a building on the avenue de Suffren in front of the Ecole Militaire.